✅CAR FINDER FUNCTION: 10 W wireless charger has a special car finder function. You can scan the app by your cell phone and upload it, then it will show you the way to car. With A GPS location function, you can find your car super quickly anytime and anywhere, make life easier. 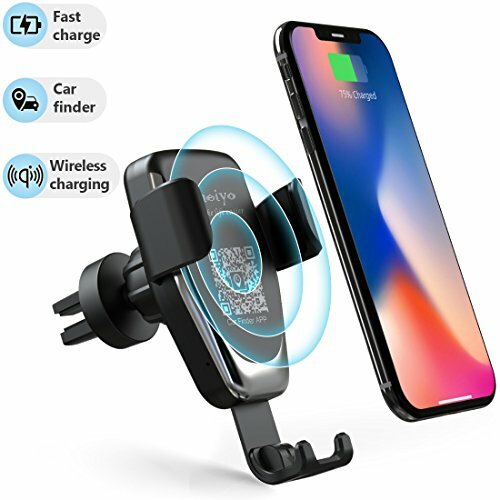 ✅2-in-1 DESIGN: This car qi charger holder mount can be clipped to your car's air vent / dashboard mount for convenience,securing grips pad holds phone securely in place and prevents falling. ✅ADJUSTABLE VIEWING: The fully 360-degree rotation provide you with the best viewing angle.The holder ensures safe driving whether you are talking, navigating, listening to music or charging. ✅SINGLE-HANDED OPERATION: Simple installation and removal of smart phones. No Tools Needed. The soft silicone pad can protect your devices from friction and slide. it still has huge room for the phone when you pull the pad. L-shaped hook design is table to clip the vent. Car wireless charger with high speed charging (built-in coil with 10w output) has overcharge and short circuit protection. ✅COMPATIBLE DEVICES: Fit for Samsung Galaxy S9, S8, S8+/ S8 Plus, S7, S7 Edge, Note 5, Note 7, S6 Edge Plus, iPhone 8, iPhone 8 Plus, iPhone X and all QI devices that support wireless charging.